Green Man Gaming Gift cards allows you to give someone (including yourself) the gift of gaming goodness. 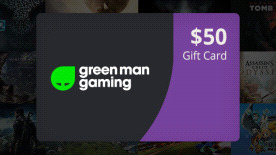 Use the gift card as credit to buy anything you want on www.greenmangaming.com - that’s over 4,500 games and DLC’s! Or get it as a gift for someone special by simply forwarding your gift card key to them. Best price tip: Sign in to your account before your add anything to your cart to get the best VIP prices. Don’t forget: You can use your gift card to buy PS4 (US only) games too!